Some say creativity ebbs and flows. For me, it’s no fun when it is at low tide. Today’s sketch is a self portrait. Instead of looking in a mirror, I used my phone camera. I snapped a couple of pictures of myself. They were backwards, when I looked at them later. The lighting was good resulting in a wide range of tones across my face. I wore a gray waffle-textured, long-sleeve shirt. The shirt, sketched with a gray marker, looks like prison garb. I really must work on blending. Prison garb is just about right for the way I’m feeling. No get up and go so far this year. 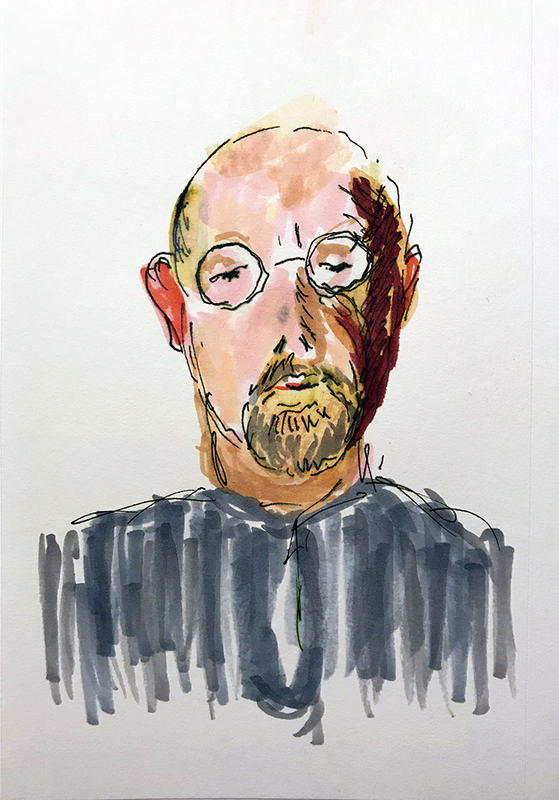 This entry was posted in Personal Stories and tagged artistic process, creative process, creativity, drawing, emotion, pen and ink, portraiture, self portrait, sketching, visual arts. Bookmark the permalink. I hear you, Kerfe. For me, I think it has to do with the new year, although I’m not sure why. There’s a restlessness in 2018 so far for sure. Hey we have the same hair …that is a good thing isn’t it?